How to color Colossus, a character from X-men comics. 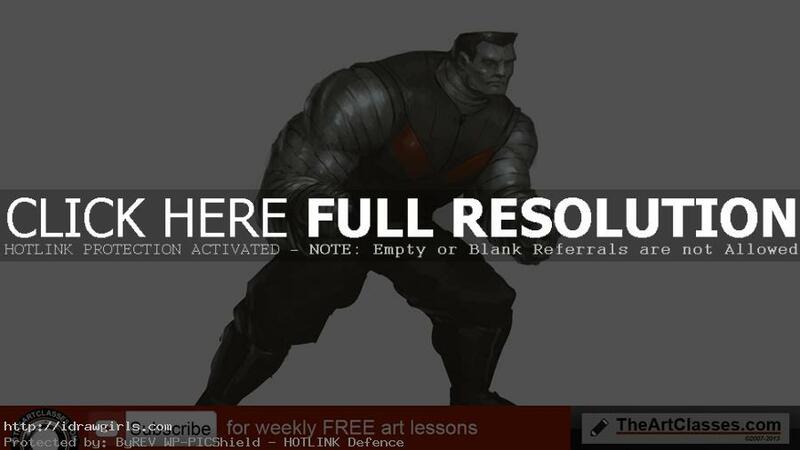 This video tutorial shows you how to color a character drawing, Colossus. In this process, I use default three-quarter lighting from the front. It is the most common in lighting in character design. There can also be bounce light along the shadow side of the subject. When you look at the brightness scale on your interface, you will use one section for light and the second section for shadow. If you want to see Colossus drawing tutorial, you can go to how to draw Colossus. You can scroll down further to see step by step images with instruction. This is a painting of a quick coloring process of an anti-superhero, Deadpool. In this tutorial, I am going to use default front lighting. I like to set the background in mid tone. You have to pay a lot of attention to the value you use in light section and shadow section. Make sure that you have enough gap of value range in between them. Once you set the value range of the light area and of the shadow area. You cannot over the cut-off value you set when you add detail to the character. First, I focus on rendering with the middle range of value. A good form is important in painting. If you can get the initial form right, you are more than halfway done. As long as you form contains correct lighting, it will look realistic. A bit of contrast in lighting will help your painting looks solid without much effort. When you add secondary detail. Make sure you use the value sets within the range of that specific area. Step by step tutorial, coloring Colossus. 2) Limited value of light and of shadow.